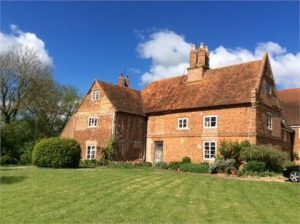 Posted 19th April 2019 by Russell Collins & filed under Blog. Posted 23rd February 2019 by Russell Collins & filed under Blog. 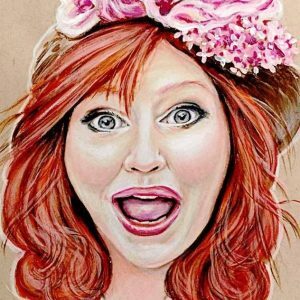 Paint Night Art Classes in Milton Keynes I thought I would say a few things about ideas for the future as I want to continue to provide ever improving quality events. Posted 1st September 2018 by Russell Collins & filed under Blog, Bob Ross. The Joy of Painting The Joy of Painting is the name of the series of TV painting lessons run by Bob Ross the American painter. 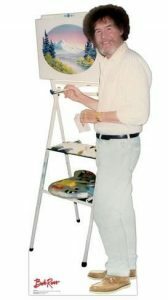 During each half-hour episode, Bob Ross would show and describe the techniques he used to produce his landscape paintings in 30 minutes. Posted 12th August 2018 by Russell Collins & filed under Blog, Painting Lessons. Brush Party, Paint Night Party, Paint and Sip It doesn’t matter whether you call it a Brush party, a Paint Night Party, a Paint and Sip night or even a Booze and Brushes night, the aim is till the same – have fun with friends in a creative setting. Posted 6th August 2018 by Russell Collins & filed under Blog, Painting Lessons. 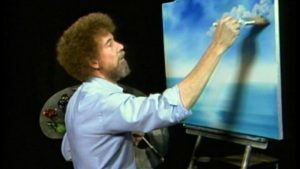 Bob Ross Lessons in Milton Keynes I run Bob Ross lessons in Milton Keynes. In fact it appears that I am the only Bob Ross instructor in Buckinghamshire. If I can’t bring the Bob Ross way of painting into the Milton Keynes and Buckingham area, then I should resign from the human race. Posted 1st August 2018 by Russell Collins & filed under Blog, Painting Lessons. Posted 17th July 2018 by Russell Collins & filed under Blog. Posted 15th July 2018 by Russell Collins & filed under Painting Courses. Posted 12th July 2018 by Russell Collins & filed under Blog. Posted 29th March 2018 by Russell & filed under Blog. 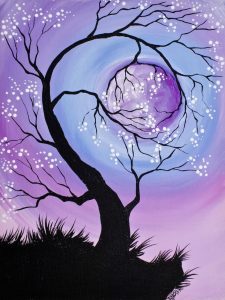 Cherry Tree Holding The Moon The first Paint Night Party, on the 25th April at The Three Trees was a great success. Fourteen people came and painted Cherry Tree Holding The Moon.